Previous image, 71 total items. Next image, 71 total items. 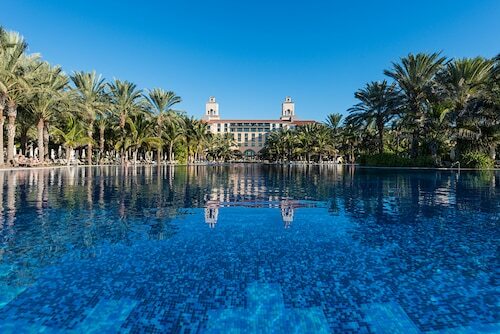 Move from island to island for year-round pleasant weather, relaxing seafront resorts, historic Spanish architecture, varied landscape and friendly locals. Although they are closer to Africa than to Europe, the seven large Canary Islands and smaller islets offer a fascinating glimpse of Spanish development in a gorgeous tropical setting. Plan a beach vacation and discover much, much more. Over 40 percent of the lands and waters of the Canary Islands are protected parks and reserves. Enjoy varied terrain of volcanoes, laurel forests and natural swimming pools. Visit some of the four national parks, three marine reserves and seven biosphere reserves. All seven islands have exceptional dive sites, with clear water to 100 feet (30 meters) deep. Investigate the Gran Canaria wreck of the Plasencia and explore the underwater lava of Punta Restinga on El Hierro. If you’re not a diver, try snorkeling in the warm waters, a comfortable temperature year-round. Tenerife is the largest island. Ride a cable car or hike to the top of its volcanic Mount Teide, the islands’ highest peak. In Santa Cruz de Tenerife, see 17th-century buildings with Islamic and Spanish architectural influence. 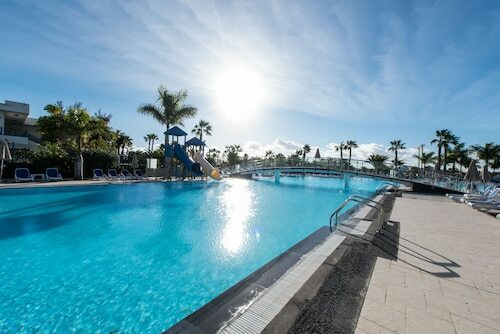 Drive to Costa Adeje for superb beaches and exciting water parks. For an otherworldly experience, ride a camel over the multicolored lava rocks of Timanfaya National Park, part of a UNESCO biosphere on Lanzarote. Appreciate the contrasting lush forests of laurel and ferns of Garajonay National Park on La Gomera. Walk among pine trees and gaze into a volcanic cleft nearly 1 mile (1.5 kilometers) deep in La Caldera de Taburiente National Park on La Palma. Climb the sand dunes of Corralejo Dunes Natural Park on Fuerteventura or windsurf off its western coast. Take a water taxi to the small, uninhabited Lobos Island to enjoy the shallow lagoons. Look for some of the thousands of plant and animal species endemic to the islands and surrounding waters. Fly to the main Canary Island airports on Tenerife or Gran Canaria and fly, ferry or sail between islands. Rent a car to explore your home island or simply find your favorite beach spot and enjoy days of quiet relaxation. This Spanish island offers sophisticated seaside resorts, stunning volcanic caves and César Manrique’s intriguing architecture. The third largest of the Canary Islands, Gran Canaria offers everything from secluded beaches to charming whitewashed villages and beautiful cathedrals. With its glistening beaches, breathtaking landmarks and bustling towns, the largest Canary Island has activities to suit all visitors. Enjoy the pleasant ocean breeze and relax on pristine stretches of white sand on this island of scenic parks and dunes. Discover sand dunes and lagoons in the natural park before sunbathing at one of the many beaches in this serene region. Situated near the airport, in San Miguel de Abona, this aparthotel is close to Golf del Sur Course and Amarilla Golf and Country Club. Area attractions also include Monkey Park and Camel Park. This family-friendly Mogan hotel is located by the ocean, within 1 mi (2 km) of Plaza Las Gananias and Mogan Port. Angry Birds Activity Park and Puerto Rico Shopping Center are also within 6 mi (10 km). 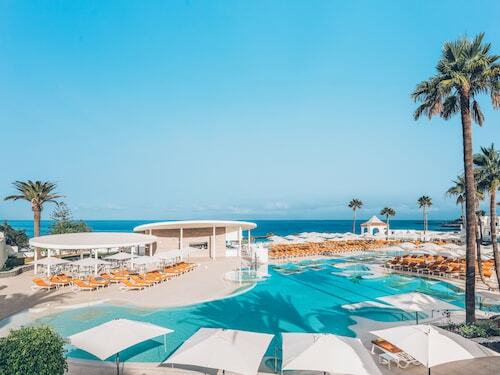 This family-friendly Adeje resort is located on the waterfront, within 3 mi (5 km) of Ajabo Beach and La Caleta National Park. El Duque Beach and Golf Costa Adeje are also within 6 mi (10 km). Situated in Yaiza, this hotel is 0.9 mi (1.4 km) from Dorada Beach and within 3 mi (5 km) of Marina Rubicon and Aqualava Waterpark. Nuestra Senora del Carmen Square and Atlantic Museum are also within 2 mi (3 km). This family-friendly San Miguel de Abona property is located near the airport, within 1 mi (2 km) of Amarilla Golf and Country Club and Golf del Sur Course. La Tejita Beach and The Red Mountain are also within 6 mi (10 km). 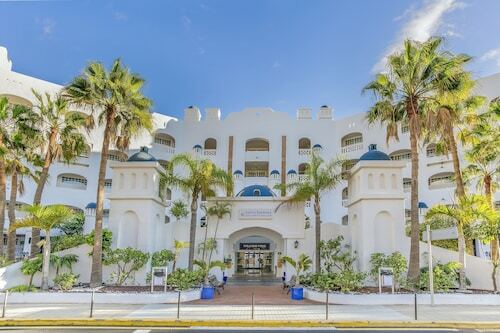 Situated near the boardwalk, this hotel is within 1 mi (2 km) of La Charca Lagoon, Maspalomas Lighthouse, and Maspalomas Golf Course. 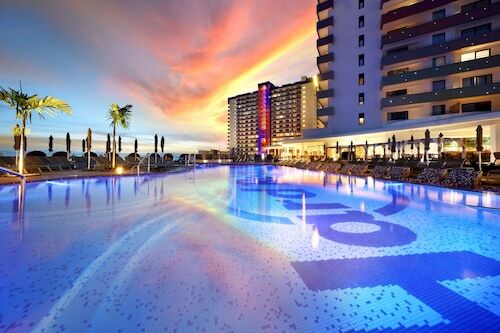 Yumbo Shopping Center and Meloneras Beach are also within 3 mi (5 km). Offering direct access to the beach, this Arona hotel is on the boardwalk and within a 5-minute walk of Troya Beach and Veronicas Strip. Siam Park and Las Vistas Beach are also within 1 mi (2 km). 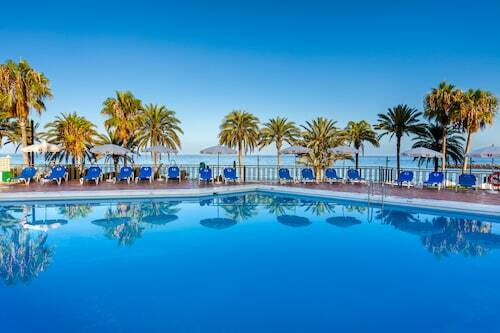 Offering direct access to the beach, this Costa Adeje hotel is within a 15-minute walk of Fanabe Beach and Puerto Colon Marina. Aqualand Costa Adeje and Siam Park are also within 1 mi (2 km). Wed., 8 May - Mon., 17 Jun.